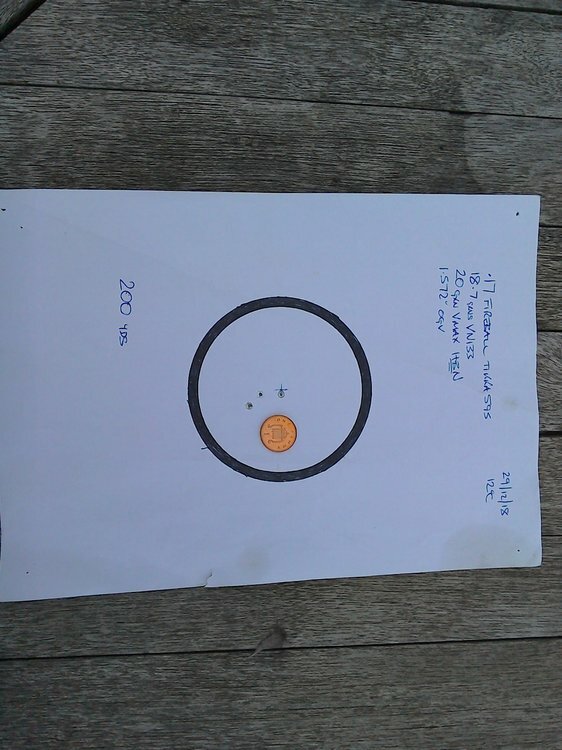 A few questions I'd like to get some info on please, as to what produced the best accuracy for you in your rifle with 20 grn and 25 grn Vmax bullets. I appreciate there will be other factors to the accuracy you're getting,and if you'd Ike to share them that would be great. I'll be trying Vn133 with 20grn Vmax in remington brass for starters. What worked best for you ?? I have used several powders to good effect in my .17 FB,, including Ramshot Xtreme, H4198 and of late RS40.....although I have not shot this last batch yet. I primarily use the Krank's 17gr bullets (but have used 20 and 25gr vmax) and find there is little difference in point of impact if I load to similar velocities. I normally aim for about 3800 FPS, so not too hot. As for length, I load to standard length given by Quickload, as I worry that even a small difference can increase pressures more than wanted. The rifle is a Remington 700 VSSF II with a 26" varmint barrel and I have had regular .5 MOA at 100yds with all loads. Just remember to start safe and work up in small increments, as pressure increases far faster in the little 17 FB case than in others. Thanks for that mark,sounds good, hopefully the RS40 performs well too. I'm just waiting on my FB being built at the moment,so will be be nice to get as much info as possible before getting it. That's one thing that's bugging me, barrel length, I'm thinking 24"but got 23"and 26" in mind!!! I have a 17 Mach IV which is the wildcat Remington mainstreamed to become the Fireball so very close. I have used Benchmark and H322. Benchmark was a bit grubby and seemed to take ages to get the barrel clean. H322 much cleaner. Grouping was good with both but H322 easier to clean. I will probably try N133 next. I run the 20gn Vmax at about 3,800fps with 18gn H322. Mine maxed out at 18.8gn and a touch over 4,000fps. No real pressure signs BUT no increase in velocity between 18.6gn and 18.8gn so deffo time to stop especially with a 17. I haven't measured the velocity of 25gn loads but use 17gn powder which is mild and accurate. Thanks for that info Mike,it's all being gratefully received. certainly is an efficient little round?. I find H4895 powder shoots well in my 17rem but is dirty compared to Viht. N133 performs well in the 204 so hoping it'll work well in the fb too!! Interests:3D printing, DIY night vision, electronics, stick making, reloading. I've been making a few for folk that complain about fit, I tried the 17 satern on my hornet cases and it was awful, that's what got me started. Got fed up of carefully weighing a charge only for some of it to end up on the table. I know what you mean about not a perfect fit,but I just filled 6 cases with my 20 cal satern and it didn't spill a grain so hopefully will be ok☺. The fireball has landed😃, not as planned with the semi custom but a rebarrel on my tikka 595, so been busy prepping 100 cases and loading some for a barrel running in and some three shot groups session today. Cleaned barrel and coated bore with hbn,first shot 4058fps with 20grn Vmax and 18.5grns vn133, fired another 8 rounds, same load but different ogv lengths between 3938 and 4005 fps with just dry patching till clean between shots,then before the 10th shot I gave the barrel a proper clean with wipeout and not a hint of copper on the patches ☺, got barrel sqeaky clean and recoated with hbn again and got 4050fps,8fps different than 1st shot. 19.1 grns vn133 gave me 4093av fps,but filled case half way up neck so that's max. Got a couple of 3 shot 1/2" groups , with both groups having the first shot on a clean barrel so pretty happy so far☺. Next step,some different bullet seating depths to hopefully tighten up the best groups. Really liking this little fireball already 😃😃. Perfect for a testing session today, no wind,so Just going out to try some more loads, hopefully find "the one"
Happy to say I got the load😃 20grn Vmax *hbn* coated,18.7grns vn133, 5 thou jump, 4066 av fps, cloverleaf 1/4" 3 shot group. Shot 3 groups same powder load,same bullet, but different ogive lengths,5 - 40 thou jump,all shot 1/2" and under and went from 4009 to 4066 av fps. Then tried one load with 25grn vmax which shot 5/8"at 3906 av fps, so a bit of fiddling should tighten that up too. Nice one. They're shifting! Decent BC on those 25gr V-Max. If you can develop a good load they'll be great for long range rabbit/corvid control! 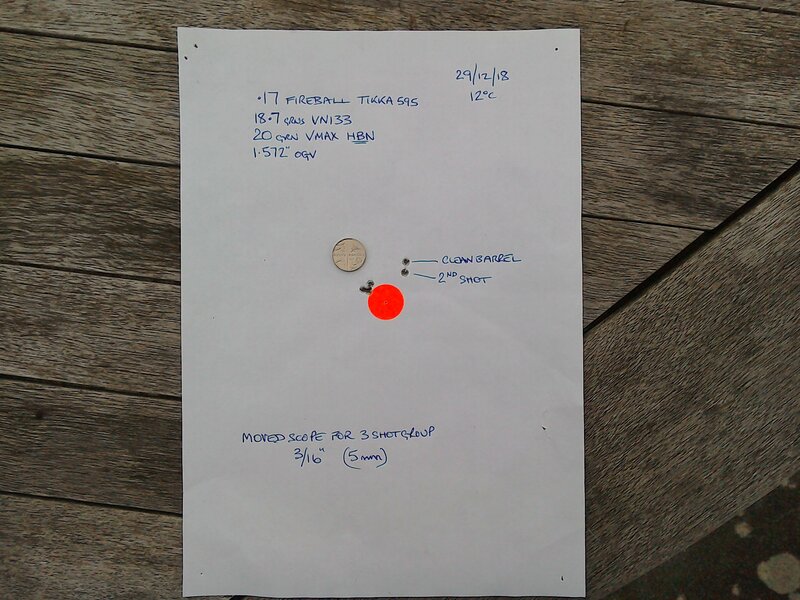 Keen to get rifle zeroed today and try another 3 shot group at 100 and 200yds , was a bit windy but had it straight on which was better than a side wind, anyway was well pleased that the second shot went less than 1/4" c - c below the clean barrel shot😃. Then moved scope and shot a 3/16" 3 shot group,so repeated the 1/4" group from before 😃😃. Moved scope 1 click to the right and shot a 3/4" group at 200yd which dropped approx 5/8" av from the 100yd zero, so nice and flat out to 200,and very happy with this how this little fireball performed with the 20grn vmax, as wasn't the best of days to test. Hi gunner, barrel is a 9 twist Sassen(border) heavy tikka profile, no not Neil. 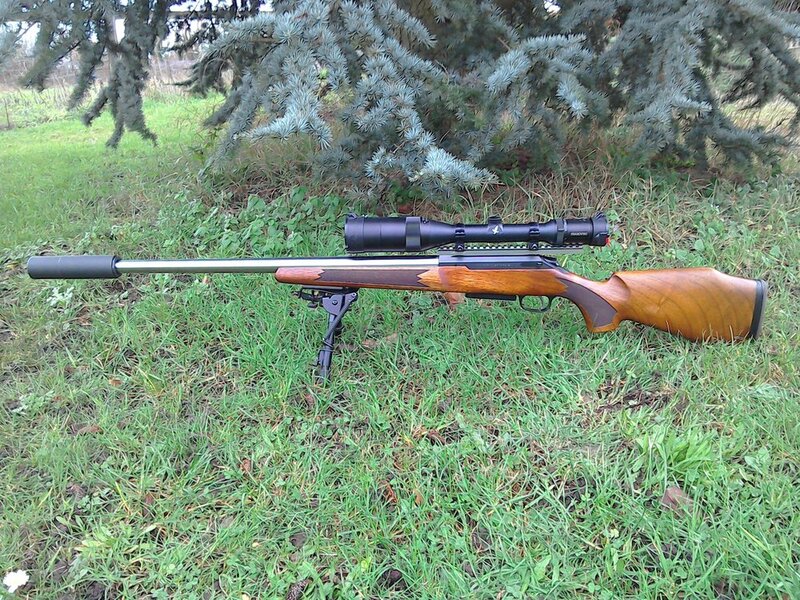 Lovely looking rifle. Quite like the 17 rem and fireball. Great little vermin bashers. Do like the 204, though. Nice gun shoots well, quite a heavy tube ? 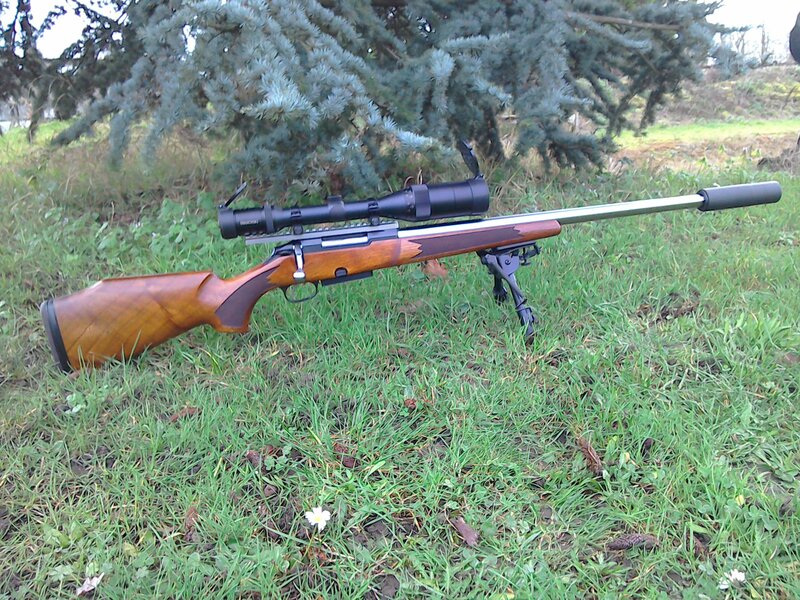 Thanks chaps, yes she does shoot well,Gona get a bunnie tonight and hopefully christen her on a magpie tomorrow 😀 ,I like a nice bit of wood on a rifle, keep thinking about a grs stock for it but can't bring myself to change it . Barrel does look heavy in that pic, here's another one that looks more like it. Yeesss - magpies , my favorite quarry . Its going to be fun shooting them with that . Barrel is straight taper ?